One of today's CBS Sunday Morning segments was about podcast production—many podcasts are done with an actual staff and underwriting that supports professional-level promotion as well as production. Me, I’m just small potatoes. Yet somehow both Wikipedia and Google take notice of my work. 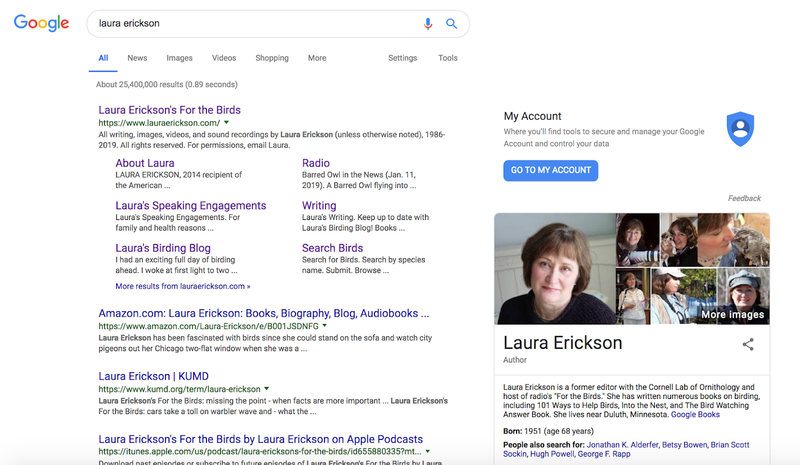 After I did a blog post about why Muhlenberg College professor Dan Klem, who pioneered research into bird-window collisions, deserves much more recognition, Wikipedia used that information as a starting point to create a whole entry about Klem, using my photo of him and citing me in the references. 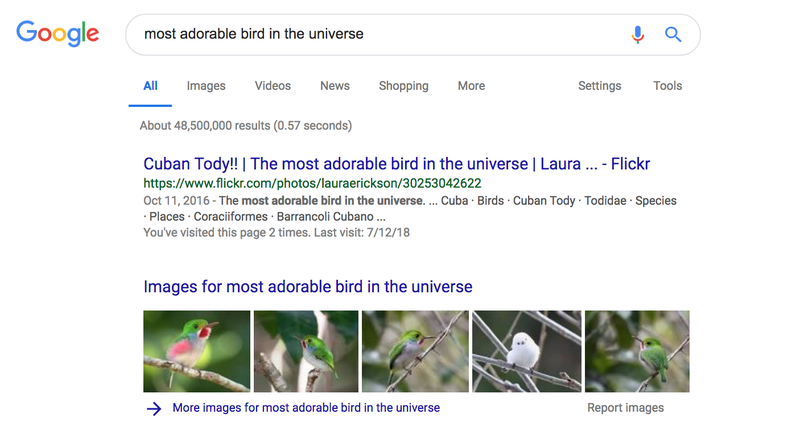 If you google the term “Most adorable bird in the universe,” my Flickr photos and blog posts about the Cuban Tody are invariably at the top of the results. 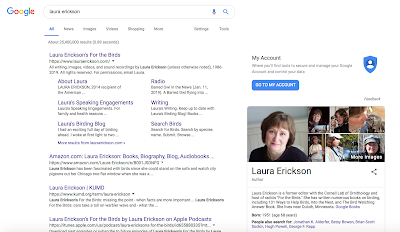 My blog posts and web pages are also at or near the top of the search results when people google several topics I’ve covered rather thoroughly, such as the owls of Harry Potter, bird tongues, whether feeding jelly to birds is good or bad, why baiting or feeding owls is bad, whether birds fart…just the kinds of questions inquiring people ask. 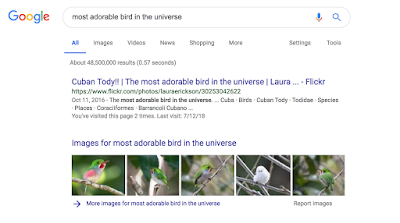 I haven’t written about most of these topics in years, but information like this stays current and accurate over time, and somehow Google's algorithms send these kinds of questions my way. Last week, someone in Bala Cynwyd, Pennsylvania, apparently googled “twin chicks,” “double yolked eggs hatching,” or something like that, and found my blog post about “Twins and Double Yolks in Bird Eggs.” The Narberth-Bala Cynwyd Patch posted an article Thursday titled “Twin Chicks Born At Bala Cynwyd Middle School,” about a class studying a unit on embryology and genetics. As part of their studies, the students received 24 chick eggs. The eggs hatched over the weekend, and when the students looked in on them on Monday, January 14, what to their wondering eyes should appear but 30 chicks! If this is accurate, it means that at least six pairs of twins had been produced, which is one of the most extraordinary things I’ve ever heard of. This is beyond rare, for the most likely explanation would be six twins in a batch of 24, which (as two of our math teachers calculated) is a one in a quintillion chance. Our research has shown the probability of having a double yolk is rare, and having two chicks born from the same egg is even rarer. When twin chicks are born, they usually need help such as a human cracking the egg shell for them. Since all the chicks looked perfectly healthy when we came in on Monday and since none (as far as we're concerned) had aid at birth, this is a confusing event. I don’t get paid in money for my podcast or blog, but discovering that my work is useful for students a thousand miles away is more rewarding than money would be. It’s still mystifying how two and a half dozen chicks hatched from two dozen eggs, but life is filled with mysteries—during trying times it’s wonderful when a mystery is as fluffy and adorable as six extra baby chicks.